Opsoclonus Myoclonus Syndrome (OMS) is a rare, orphan disease primarily impacting children between the ages of 1-5 years old. OMS is an autoimmune disease suspected to occur when the immune system tries to battle a cancer and gets confused, attacking the brain instead. Left untreated, OMS warriors will likely have deficiencies in speech, physical activities, learning, and other general life skills. What is the average age of OMS warriors? 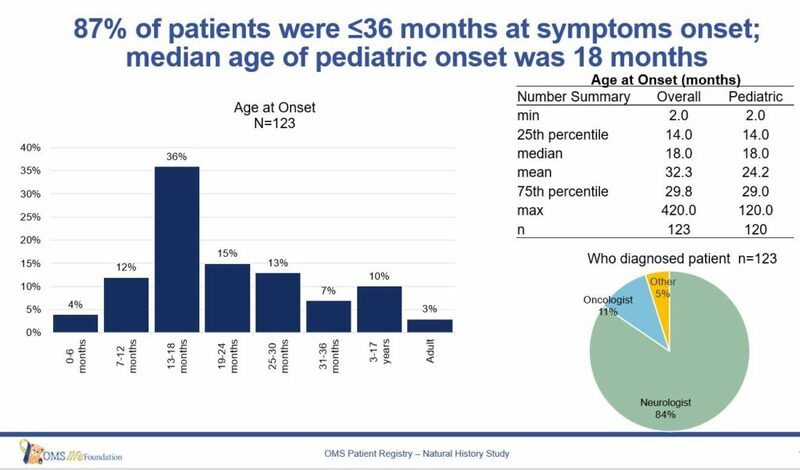 Based upon responses from 123 patients in our OMS Patient Reported Registry, we found the median age of OMS onset is 18 months. What are some of the symptoms of OMS? 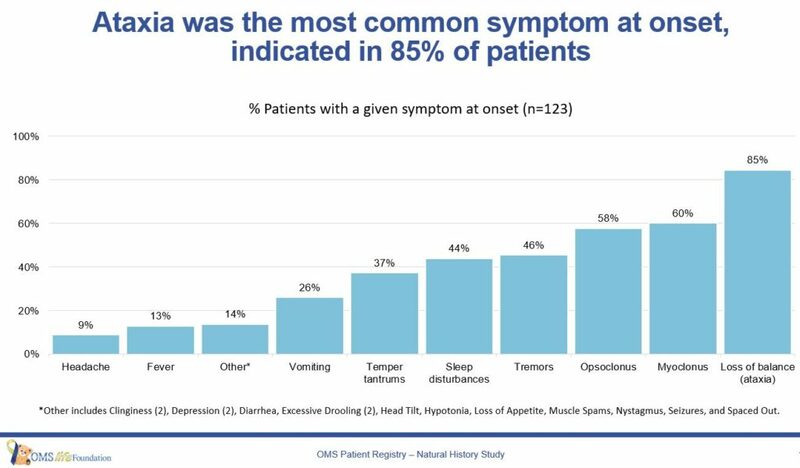 Yes, OMS can be misdiagnosed. However, we are encouraged by the data provided from the NORD Patient Reported Natural History Study on OMS. We find that over the years, the likelihood of proper diagnosis is trending favorably so that now, a patient is twice as likely to have a proper initial OMS diagnosis than the outcomes prior to 2010. Can OMS be present without finding a tumor? YES! Responses from a caregiver survey show that 60% of OMS warriors have had a neuroblastoma or other cancer detected, while 40% have not. Does OMS affect one gender more than the other? 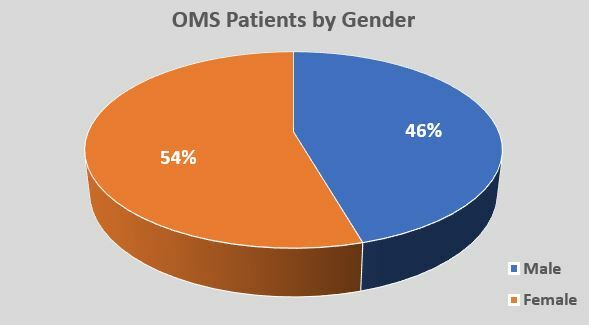 As shown on the graph, based upon the data provided from the NORD Patient Reported Natural History Study on OMS, we found that OMS impacts girls more often at 56% versus 44% for boys. What are some of the leading hospitals that treat OMS? What are some of the typical treatments used for OMS warriors? OMS warriors typically receive a treatment protocol of IvIG, high dose steroids, and chemotherapy. The high dose steroids may include ACTH, Dexamethasalone, Prednisolone, or Methylprednisolone. The chemotherapy treatment may include Cytoxin, Rituximab, or Ofatumamab. The IvIG brand names includes Gammunex, Gammaplex, Privigen, Polygam, Gammaguard, Intragam, Flemmoglobin, and Kiovig. A survey of OMS caregivers showed that the clear majority of OMS warriors have received IvIG as part of their treatment. Where can I find more information on OMS? Dr. Michael Pranzatelli maintains a web site at www.omsusa.org. The OMSLife Foundation maintains a wiki with valuable information that has been collected from OMS caregivers over the years. http:\\wiki.omslife.org.